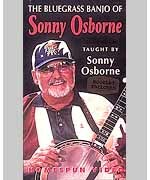 Legendary bluegrass banjo player Sonny Osborne provides informal conversational sessions, detailed instruction, historical reminiscences, and insightful advice for playing. This video details his distinctive techniques and stylistic innovations, like walk-downs, unusual endings, chordal harmonies, and more. Uses 15 classic bluegrass songs as examples, including: Rocky Top - I'll Never Shed Another Tear - Sunny Mountain Chimes - Eight More Miles To Louisville - El Randa - Sunny Side Of The Mountain. 90 Min. DVD, Includes Booklet, Level 3.